It's amazing how an interesting spectacle can bring people together. 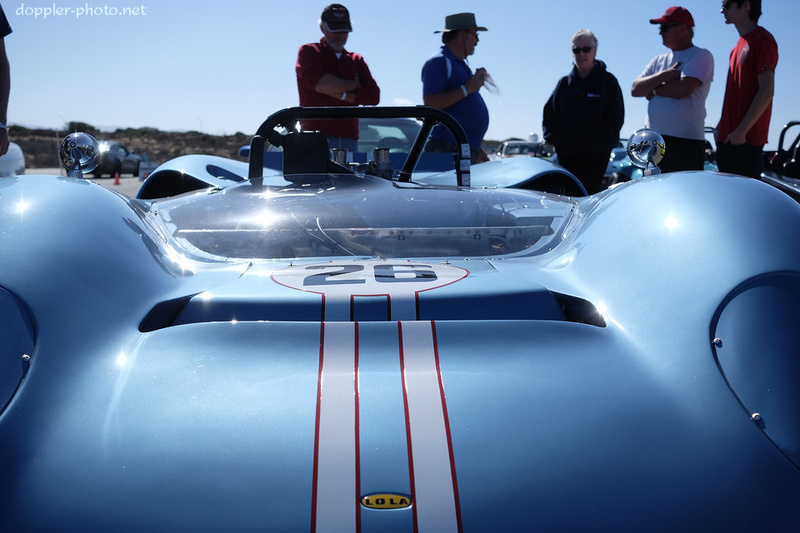 I went to an American Autocross event recently, and had the great pleasure of seeing a Lola T-70 Mk1 for the first (and, quite possibly, only) time. The car was built in 1965, and is owned and driven by David Pozzi who has a page on the car here. 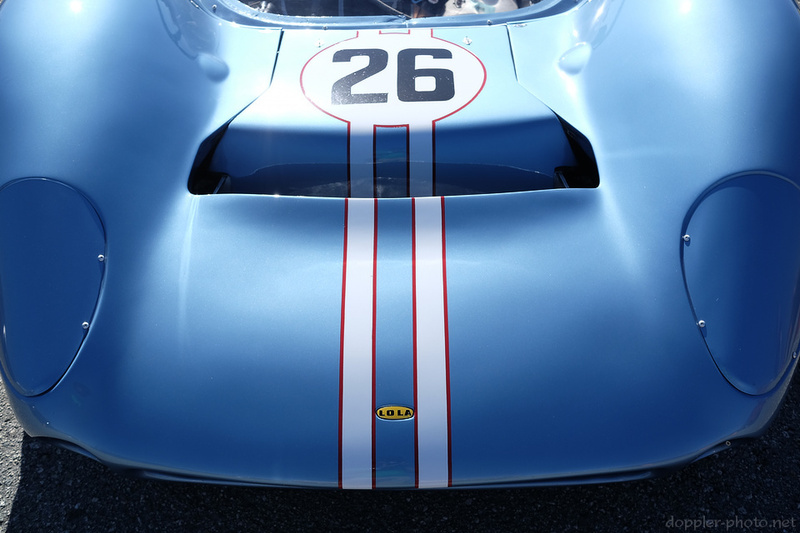 The race cars of that era had a particularly distinctive styling, which makes them easy to remember. As I took the car in, a combined sense of recollection and discovery wafted across my mind. The car is a gorgeous relic of a somewhat bygone era, and even though faster, safer, more efficient cars have followed, there's still a sense of something lost. I imagine that those feelings of wonderment and wistfulness are something all of the onlookers shared as we admired the #26 — seeing this example undoubtedly stoked the memories of anyone who had seen one in person, on television, in posters, or elsewhere. In my own case, I grew up watching the "Speed Racer" cartoon, which featured the somewhat similarly-styled Mach 5. Of course, at the time, the world of the Mach 5 was a pure historical fantasy for me. It's funny how things change. So in the short time that I had a physical manifestation in front of me, I reveled in the details that a cartoon glosses over. 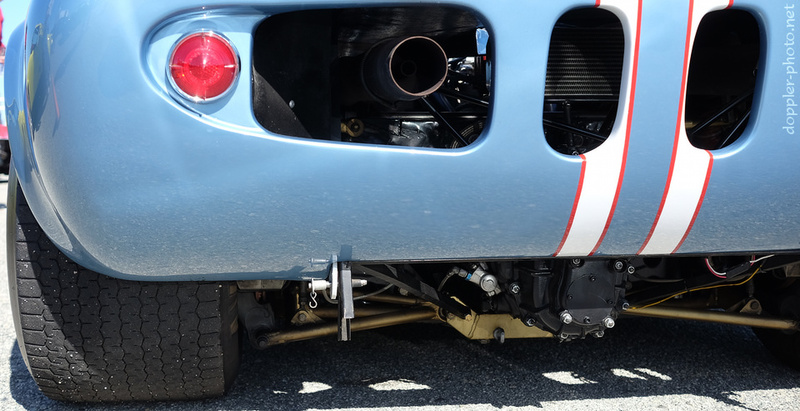 Giant tires, mid-mounted engine, rear transaxle and radiator. Plus what I assume is a hinge to flip up (or remove) the rear clam. Having spent an inordinate amount of time working on Truckula, my '85 Nissan 720 pickup, the Weber carburetors immediately caught my eye. 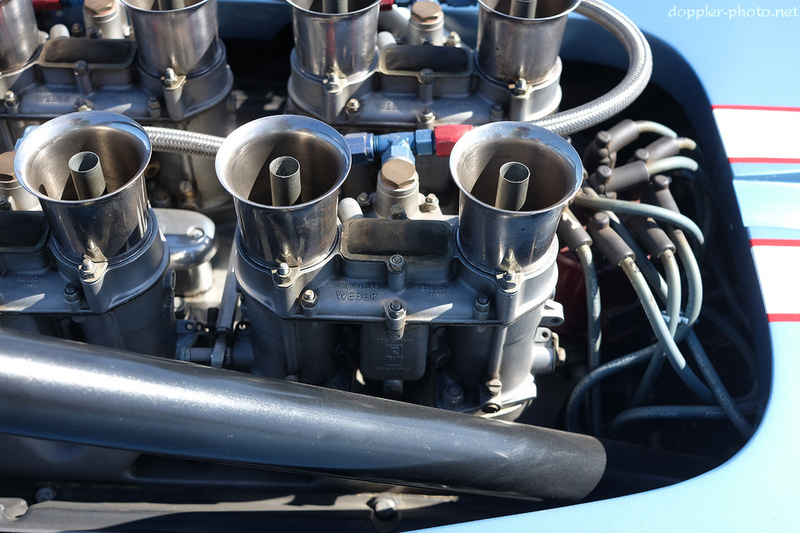 The 720 comes stock with a diabolically complicated Hitachi-manufactured carburetor, but Weber swaps are incredibly common for people looking for easier maintenance and more simplicity. Sometimes, it's easy to miss how connected our lives become with the unrecalled events and experiences of the past. Of course, if you're having a once-in-a-lifetime experience, why not make it even more special? According to other folks at the event, the Mk III Cobra in the foreground is the sole remaining Shelby Cobra that is still owned by the original owner. I didn't get a chance to chat with the driver, Ken McCullough, but what I heard is that he worked for Ford at the time, bought it new, and has owned it since. That's pretty amazing if accurate. McCullough was pretty quick in the car regardless, placing 10th by time, and 21st by index, out of 142 drivers. 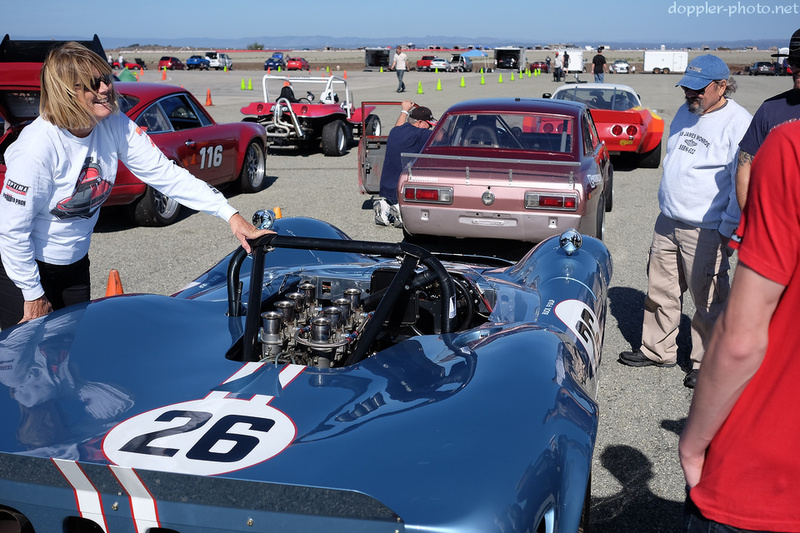 Correction [3 Nov 2014]: The original Cobra was actually the other one, the #18 owned and driven by Bruce Cambern. It appears that that car hit the tarmac only after I had departed. 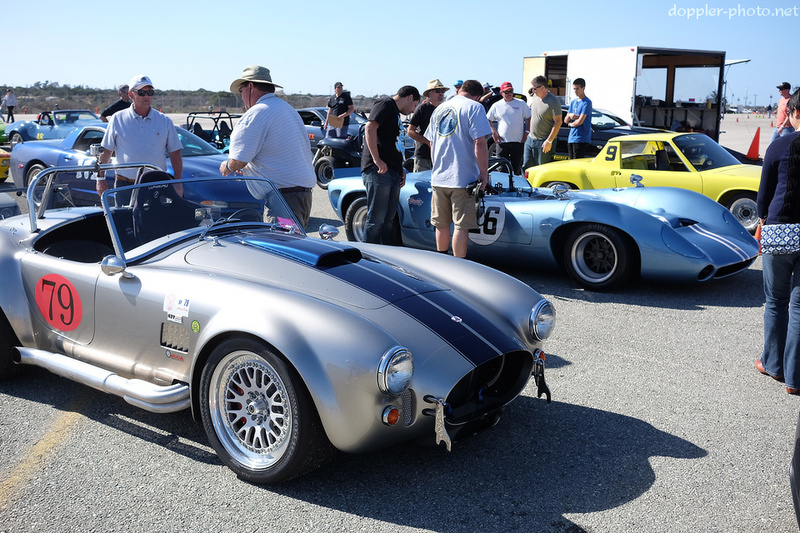 You can find more about it here: Bruce Cambern's 427 one owner Cobra. Mary Pozzi, David's wife, answers questions about the car before the autocross session gets underway. Mary would go on to place first in her own class (and 46th overall, 35th by index) driving a Chevy Camaro.